When I was little, my sister used to read to me. I may have been between the ages of 5 and 8, and my sister between 12 and 15, when she read the Chronicles of Narnia by chapter every evening. I remember that the stories she read had a great impact on my fantasy play at the time, full of secret doors and professors, and hidden lands. Since of course there is a very special character in the Lion, the Witch and the Wardrobe named Lucy, I remember it best. I was very young at the time, and completely enthralled. A few months ago, while browsing the stacks at Lyon's English language bookstore, I saw the Chronicles of Narnia offered in one thick volume and decided to read all of the stories in full. What a lovely fantasy series. "It is dull, Son of Adam, to drink without eating," said the Queen presently. "What would you like best to eat?" Turkish Delight, please, your Majesty." The Queen let another drop fall from her bottle onto the snow, and instantly there appeared a round box, tied with a green silk ribbon, which, when opened, turned out to contain several pounds of Turkish Delight. Each piece was sweet and light to the very centre and Edmund had never tasted anything more delicious. He was quite warm now, and very comfortable. I remember the image that was produced in my child's mind of this Turkish Delight, something I had never tasted or seen before. 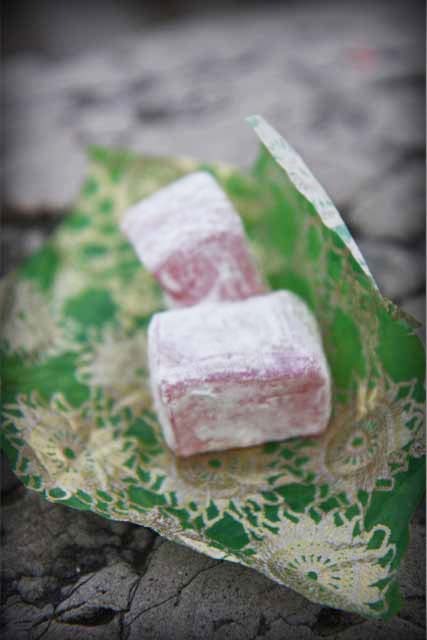 In my mind, Turkish Delight was my grandmother Cille's Divinity. I found it quite believable that Edmund was completely lured and seduced by this enchanted candy from the Witch in the story. It wasn't until I was fully an adult that I happened upon a real box of Turkish delight, purchased while in Istanbul. A different animal altogether. For the story's purpose, Divinity worked quite nicely. My imagination filled the blanks. This time around, as an adult re-reading the story, Cille's Divinity once again found its place in my mind's eye and gave me a whopping dose of comfort and pleasure. Turkish Delight!!! I remember reading about Turkish Delight as well, I still have not had any. I never see it any where. I haven't a clue what it even is. The closest I came to even SEEING it was once at a store I saw a label on a shelf of sweet treats and it said "Turkish Delight" and had the price and I looked and looked...but alas..NONE! I have had many a thought about this mysterious treat, anything that labels itself as DELIGHT has to be good..right? I remember that scene in the book too, and wondered forever what they were like. When I finally came across some (in the US), I was so disappointed that they were not my cup of tea - I didn't like jellied things as a child. However, those pale pink confections look so light and delicious. I'd love to taste fresh ones now, as an adult. Especially rose flavored. I think I would enjoy them. I love your site. I go to it for inspiration all the time. I too am wild about Turkish Delight. I used to buy pounds and pounds of it to share with my daughter. I'll have to say rose is our favorite. This post really hit home with me as the chapter where Edmund meets the White Witch and eats the Turkish Delight has always been my favorite in all of the Chronicles of Narnia books! I always imagined TD as being like Divinity as well and as a child when I eat Divinity I would always think of Edmund and his Turkish Delight. I admit I was a bit dissapointed the first time I realized the TD was nothing like Divinity. I love their other name "loukoum". I was really surprised when I first had one...but I still fall for their pretty exterior! Great read as always! Having read about Turkish Delight in Narnia but never tasted it, I certainly allowed my son-in-law to take over the kitchen to surprise his wife with 5 flavors of it their first holiday back from studying abroad...Fantastic story..
First time when I saw these photos I said " Thank God, I am not pregnant". You captured the spirit, as always. Those are so pretty Lucy. Did you buy them wrapped in that wonderful paper? What beautiful little treat-I love that paper....great post! Thanks everyone, for the comments. The paper is an accessory, from my enormous stash of papers which I continue to amass. Great article on Turkish delights. enjoyed the reference to Cille's divinity. My favorites are chocolate chip cookies. I enjoy reading your blogs and caught up on several days worth on Sunday.